The heat from the blaze caused damage to the road suface with emergency repairs carried out late last night. Picture by Sam Kirk. The commute was back to normal for drivers on the A92 this morning after emergency repairs were carried out late last night (Wednesday). Workmen were called out to fix damage to the road at Lochgelly following a huge blaze after a collision between two articulated lorries around 9.35am. The whole road was closed for several hours, partially re-opening to traffic around 2.30pm, with diversions via the Lochgelly slip. A spokesman for BEAR Scotland said: “The A92 southbound at Lochgelly was re-opened at 11.50pm last night after emergency repairs were completed to the road surface following an earlier vehicle fire. 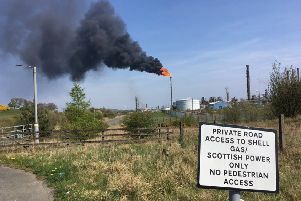 “The route remained closed to ensure the safety of road users following yesterday’s incident and allow teams from BEAR Scotland to carry out emergency resurfacing due to the significant damage caused by the vehicle fire. “Following completion of the works the road reopened just before midnight and the temporary diversion was lifted.